Laminated floors are ideal for kitchens, bathrooms, and any other area of your home that needs a low-maintenance, high-style flooring upgrade. For the elegance of hardwood flooring without the maintenance and cost, consider our wide selection of laminate hardwood flooring. Laminate can be manufactured in a variety of shapes and sizes, suitable for any need. It is produced from layers of natural resins and fiberboard compressed together into a durable core, on top of which is a photograph layer or “applique” layer that can be printed in a wide variety of patterns. Manufacturers produce laminate hardwood flooring to simulate all varieties of natural hardwood, and the finest brands incorporate saw marks and wood snarls to make these planks virtually indistinguishable from the real thing! No matter what type of flooring you select, a laminated floor installation will always add value to your home. Adding sophistication and warmth, it easily matches any decorating style and design and seamlessly works with any room in the home. 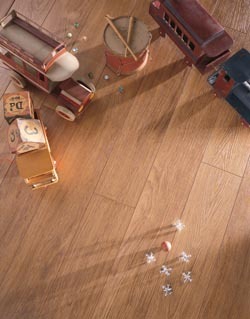 Our laminated flooring can also be the right eco-friendly choice as well. Many of our laminated flooring options qualify as Green Select products, only available to easily recyclable products with a minimum percentage of recycled content. Laminate is made from natural, sustainable melamine resins and fiberboard, so an investment in durable laminated flooring also works as the lower-emissions choice for the environment. Classic or modern tile styles are affordable for any room with our variety of laminate floor choices. Like laminate planks, laminate tile is produced in a variety of shapes and styles to simulate ceramic, porcelain, and even natural stone tile such as marble or slate. This allows homeowners to get the elegant look of tile flooring at a budget-friendly price. Laminate tile flooring is especially appropriate for high-traffic areas. Laminate tiles are stylish and durable, and even if an individual tile got damaged, replacement is inexpensive, easy, and invisible. Installing laminate flooring is fast and easy. Laminate is usually installed “floating” over an underlayment of foam or film, and many of these flooring options are either glueless or come with a glue backing for maximum efficiency and accuracy. Most quality laminate manufacturers use a “click-lock” system in which each plank or tile fits together via tongue and groove joints. This allows your new laminate floor installation to be flawlessly assembled like a puzzle on the floor, and prevents it from accidentally separating in the future. All of our installations are guaranteed for the lifetime of your floor, so ask today about our professional installations that save you time and money. Our certified installation specialists make sure your flooring looks perfect and satisfies your needs in lifestyle, performance, and price. Contact us at <PHONE> now for more information on laminate flooring in Rochester MN. We also proudly serve the communities of Byron, Kasson, Eyota, Dover, Stewartville, Spring Valley, Dodge Center, Plainview, Pine Island, Zumbrota, Lake Rochester, Wabasha and Winona, Minnesota.